WASHINGTON — House Majority Leader Eric Cantor is boasting in a new campaign mailer of shutting down a plan to give “amnesty” to “illegal aliens,” a strongly worded statement from a Republican leader who’s spoken favorably about acting on immigration. The flier sent by his re-election campaign comes as Cantor is under pressure ahead of his June 10 GOP primary in Virginia — and as the narrow window for action on immigration legislation in the House is closing fast. Cantor’s flier underscores how vexing the issue is for the GOP. Advocates on the left are accusing Cantor of standing in the way of getting overhaul legislation through the House 11 months after the Senate passed a sweeping bill. Cantor’s tea party opponent, Dave Brat, claims that Cantor backs amnesty. 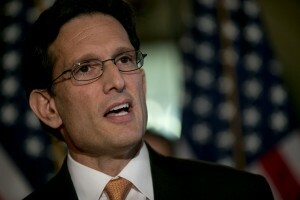 Cantor is not viewed as vulnerable, but Brat’s campaign has gotten attention and Cantor is moving to shore up support. Cantor and House GOP leaders have said they want to deal with the immigration issue, but they’ve advocated a step-by-step approach rather than the comprehensive bill backed by Obama and Reid. They’ve made no move to bring legislation to a vote and appear increasingly unlikely to act this election year. Cantor, seen as next in line to be House speaker, has sent mixed signals on immigration of late, giving ammunition to critics on both sides. Last week he helped to block legislation giving citizenship to certain immigrants here illegally who serve in the military. GOP supporters were trying to add the measure to an annual defense bill; Cantor opposed that move but said he still supports the goals of their legislation.